Iranian President Mahmoud Ahmadinejd has directed the country’s Central Bank to revaluate the currency. “I have asked the Central Bank to fix the exchange rate closer to its real value. Considering the level of our foreign exchange reserves, I believe the real exchange rate (to dollar) is much lower than their (Central Bank’s) 1,600 toumans per dollar rate,” said Ahmadinejad [Mehr News Agency, 30 October]. The Iranian president had earlier announced that his country’s foreign exchange reserves were in excess of $100 billion. Iranian President Mahmoud Ahmadinejad said in Tehran on Saturday that UN, US and EU sanctions against his country have been the “most ridiculous and failed” move adopted by the world powers. "Imposing sanctions on Iran was the most ridiculous political decision ever. It was a failed thing from the beginning," Ahmadinejad said [IRIB, 30 October]. "What do you want to sanction? Energy. We are energy producers. We have the second largest reserves of energy products in the world," Ahmadinejad added. Iran's Commerce Minister Mehdi Ghazanfari also reiterated Ahmadinejad’s take on the sanctions, calling them “ineffective,” [IRNA, 30 October]. However, the president of the Iranian Chamber of Commerce had said earlier that the sanctions had begun to take a toll. "Sanctions can't halt the importation of goods into Iran but estimates indicate that the cost of imports has increased between 15 to 30 percent,” said Mohammad Nahavandian, the Chamber president [ISNA, 27 October]. On Saturday, Ahmadinejad also said that Iran’s foreign exchange reserves exceed $100 billion. "The country's foreign exchange reserves have been estimated at $100 billion, but it's definitely more than this figure," said Ahmadinejad [IRNA, 30 October]. Iran's Central Bank Governor Mahmoud Bahmani said Tehran has boosted its reserves by buying “hundreds of tons” of gold at a price that has since doubled [IRNA, 30 October]. Iran is suing oil companies in The Hague for refusing to refuel its Europe-bound flights, a top Iranian aviation official said today. “Iran is taking legal measures and the issue has been raised in The Hague tribunal and lawyers have been appointed to pursue the issue,” said Farhad Parvaresh, the CEO of Iran Air [AFP, 30 October]. The ban on refueling includes airports in London, Amsterdam, Stockholm and several German airports. Iran Air flights from Europe now are making stopover at Vienna where Austrian oil firm OMV still refuels its planes. Iran has accepted the invitation by European Union foreign policy chief Catherine Ashton to attend the P5+1 talks on its nuclear program. The talks are expected to be held in Vienna in mid-November [Press TV, 29 October]. In the past two weeks, senior Iranian officials had sent confusing and often contradictory signals on Iran’s intentions to attend the talks, some wanting preconditions for the talks. Today’s announcement by Iran’s Supreme National Security Council did not contain any preconditions. 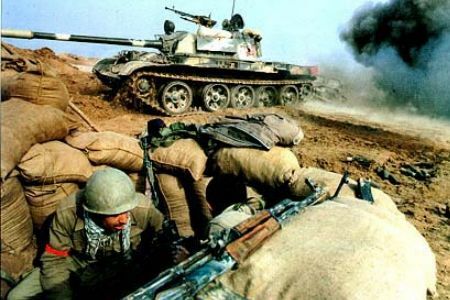 Iran and Iraq have held talks on the fate of soldiers and civilians still missing since the end of their eight-year war in 1989. The International Committee of the Red Cross (ICRC) will support the efforts to expedite the long-stalled search for the missing from both sides. "Over 20 years have passed since the war ended, and tens of thousands of Iranian and Iraqi families still do not know what happened to their missing loved ones," Eric Marclay, ICRC’s deputy chief of operations for the Middle East, said on Thursday [AFP, 28 October]. "We very much welcome the progress achieved, and the commitment and determination of the authorities on both sides," Marclay added. Nearly a million people were killed in the war, with thousands soldiers and civilians still missing. The two countries insist that they no longer have prisoners of war. Reporters Without Border (RWB), the international NGO that advocates freedom of press, today warned that Iran is cracking down on journalists “remorselessly.” In the past two weeks alone, a journalist was arrested for the second time in a year and two women journalists whose journalist husbands are already in jail received jail sentences. Mohammad Reza Moghisseh, editor of Bist Saleha. He was arrested on 22 October for the second time in a year. In October 2009, he was arrested and spent 150 days in solitary confinement in Tehran’s notorious Evin prison. Jila Bani Yaghoob, a blogger and reporter, was sentenced to one year in prison on 22 October by Tehran revolutionary court and banned from journalism for 30 years. Her husband, Bahman Ahmadi Amoee, in detention since June 2009, has been given a five-year jail sentence. Amoee’s blog, We are Journalists, won “Best of the Blogs” prize given by Deutsche Welle last April. Mahssa Amrabadi, another women journalist, was sentenced to a year in prison by Tehran revolutionary court on 14 October. Her husband, Masoud Bastani, has been in prison since July 2009. He was arrested and tried along many other journalists in the Stalinist-style mass trials of August 2009. For viewing today’s RWB report, visit here. The European Union on Wednesday issued regulations covering Iran sanctions that allow for the import and export of oil and gas to Iran. Although the regulations are tougher than the UN sanctions, but the sections dealing with oil and gas leaves an opening for Iran to offset the effects of sanctions imposed by the US against the Iranian oil and gas industry. "If you want to send a tanker filled with refined petrol to Iran, and you have proved that you are not carrying any other goods that we deem illegal, Europe has no problem," said a European official [Washington Post, 28 October 2010]. "We don't want any negative effect on the Iranian population or to deprive them of energy, so we do not follow US measures that go beyond United Nations sanctions." The EU will also permit financial transactions needed to import of oil and gas to Iran. The US does not. The practical effect of the EU action might be minimal because European oil companies might still refuse to supply Iran with fuel for fear of appearing to thwart US sanctions, said the Washington Post. "We have complained to the U.S. about the extraterritorial effects of their measures on European companies," the European official told the Post. "If those companies submit to U.S. wishes, it is their decision, but we are against these policies. This is a major issue for us." US officials said Wednesday that they were broadly pleased with the European regulations, which they said could devastate Iran's oil and gas industry by sanctions against investments. "We are going at the supply, while they are going at the back end," said a senior administration official [Washington Post, 28 October]. The US Department of the Treasury announced on Wednesday the designation of 37 front companies based in Germany, Malta, and Cyprus for being owned or controlled by, or acting on behalf of, the Islamic Republic of Iran Shipping Lines (IRISL) and its affiliates. The Treasury also sanctioned five Iranian individuals who were managing these companies. The designation would practically prevent the companies to process banking transactions or obtaining liability insurance needed to run their operations. - Fifteen shipping companies, each the registered owner of a vessel already on US Treasury’s List of Specially Designated Nationals and Blocked Persons (SDN List), as blocked property of IRISL, and 15 holding companies that own the shipping companies. All of the holding companies and shipping companies are based at the same address in Hamburg, Germany. - Six companies are based at the same address in Malta, and one in Cyprus. Mohamad Talai, manager of the 11 Hamburg-based holding companies and an authorized representative of IRISL Europe. Mansour Eslami, co-manager of several of the Hamburg-based holding companies and also a director of IRISL, Maltta. Ahmad Sarkandi, the director of all IRISL front companies in Malta and director of IRISL UK, He also manages Lancelin Shipping, a Cyprus-based IRISL company. Ghasem Nabipour, the Managing Director and a principal shareholder of Soroush Sarzamin Asatir Ship Management Company. Naser Bateni, the managing director for HTTS Hanseatic Trade Trust and Shipping GmbH, and IRISL Europe GmbH. For a complete list of the individuals and entities designated by US Treasury, visit here. Two weeks ago we saw the Iraqi Prime Minister Maleki heading to Iran to seek its support for a new government. The press has reported that he was rewarded after months of behind the scenes discussions with Al Sadr and Iran. Last week we saw Ahmadinejad with cheering crowds in Lebanon. Then we saw "brothers" one from as far as South America Hugo Chavez hugging the Iranian President in Tehran. Chavez took the 3 days to give the West a big fat 11 finger wave (11 agreements signed mostly in oil, gas, and petrochemical in the areas that Europe and the US promised to sanction any country that invested in Iran). 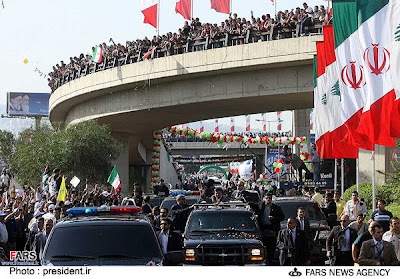 It almost seemed like there is just too much going on in Tehran these days as the Prime minister of Armenia and the president of Bolivia both arrived in Tehran on the same day. Iran's Vice president picked up the Armenian guest and Ahmadinejad made the courtesy to meet the head of state traveling the farthest, President Evo Morales of Bolivia. In between these state visits, Ahmadinejad squeezed in two phone calls with the Saudi King. Apart from the great photos and opportunity to show publicly Iran's regional power, these two conversations with the Saudi King are what probably was the most important thing that has happened in the last couple of weeks. The Israeli newspaper Haaretz is reporting that these calls have been about coming to an understanding between the two countries on how to split their spheres of influence in Iraq and Lebanon. As it seems that both in Lebanon and Iraq, Iran's star is rising and Saudi Arabia's millions invested have had no returns, Saudi Arabia is coming to the realization that it is better to come to an agreement with Iran before losing completely all influence in these two countries. It seems though that something surprising happened. Europe and the US have been pushing Saudi Arabia for the last 2-3 years to pull Syria away from its alliance with Iran. Countless promises have been made by both the European, US, and recently the Saudis for billions in investments opportunities and to bring Syria into the "civilized world" of nations if it complies. As these have all been rejected by Syria, the surprising thing that is still playing out before our eyes is that it seems with Ahmadinajad's picking up a phone and calling the Saudi's last week the Iranians have been able to turn the tables on the West. The kingdom of Saudi Arabia has seen the cards that have been played in Lebanon and Iraq and with President Assad meeting the Saudi King in Riyadh two weeks ago, what might have been happening then was the Syrians pushing the Saudi's into an agreement with Iran instead. This doesn't mean that we will see an alliance between Iran and Saudi Arabia happening any time soon but it is for sure signs of improvement in relations ahead. The words of a Saudi recently interviewed by Al Jazeera seem almost foretelling of the future "Iran is not the enemy, Israel is the enemy," the head of the Center for Strategic Studies in Saudi Arabia declared in an interview with Al Jazeera. An American spokesman recently claimed Iran is becoming more and more isolated day after day. Iran isolated? Ask the Iraqis, Venezualians, Armenians, Lebenones, Bolivians, Saudis, and Syrians what they think after only the last two weeks. 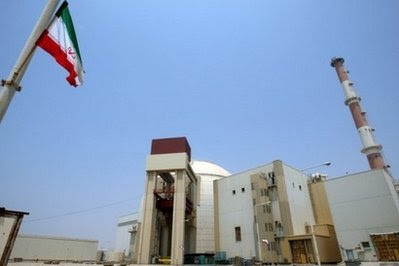 Iran began loading fuel into the reactor core of Bushehr nuclear power plant on Tuesday. The plant’s construction started during the shah’s regime in 1970s. Now after nearly four decades of delays, the facility is expected to generate electricity by January. The Iranian government’s working group on subsidy reforms has decided to increase the price of electricity from 160 rials/kWh to 400 rials/kWh, a 250% increase in price [ISNA, 25 October]. ISNA also reports that 110 rials/kWh of the new price, or 28% of revenues generated by the sale of the electricity, will be funneled to the Targeted Subsidy Fund. The Fund was created to offset the effect of subsidy reforms and the rapid rise in consumer prices on poor families. Afghan President Hamid Karzai on Monday confirmed New York Times report that his office receives bags of cash from Iran on regular basis. Karzai said however that the bags of cash cover expenses of the Presidential Palace and the transactions are “transparent.” He did not elaborate why in transparent transactions, the monies should be delivered in bags. Afghanistan has a sophisticated banking system and the monies could be transferred from one government to the other. Neither did Karzai explain how the process of the delivery of plastic bags stuffed with hard currency (Euro) to the president of the country could possibly be called transparent. Afghanistan suffers from chronic official corruption. The president, members of his family, and close friends have long been implicated in corruption scandals that have engulfed the country. The Iranian officials and the media at first called New York Times allegations untrue and an attempt by the West to discredit Afghan-Iranian relationship. But now the Afghan president has admitted to have regularly received bags of cash from Iran. Sources: Afghanistan's Tolou and all major news wires. Iran began exporting its gasoline in September with Iraq being the first customer. To date Iran has exported 32 million liters of gasoline, reports Mehr News. Iraq, Afghanistan and Armenia were the major buyers of Iranian gasoline, while Iraq’s imports accounted for 47 percent of the total figure. Iraq has been the major importer of Iranian gasoline since the country began to export domestically produced fuel, Iran’s Customs Administration reported. The report shows that 32 million liters of gasoline worth 370 billion rial (some $37 million) have been exported to foreign countries, the Islamic Republic of Iran News Network reported. This all comes after Iran was importing around 30-40% of its domestic gasoline needs prior to the latest US sanctions that warned any provider that sells gasoline to Iran would lose the large American market. The US strategy was openly discussed and debated for over a year before being passed by the US Congress giving Iran a large heads up and preparation time for the eventuality prior to sanctions taking effect. It can also be argued that the efficiency that that results in the Iranian energy market as the greater population and firms reduce their excess consumption (due to higher prices) can be attributed to the same sanctions. President Obama, you are owed a fruit basket of appreciation! The third annual Nano Technology conference, IRANANO 2010, was opened today in Tehran. Top photo: Iran’s Vice-President for Science and Technology Nasrin Soltankhah cutting the ribbon to open the conference. Bottom photo: President Ahmadinejad’s Chief of Staff Eskandar Rahim Mashaie addressing the conference. Iran's 6 month non-oil exports are in and show a 30% raise compared to last year. "Some 14.3 billion dollars of non-oil goods and gas condensates have been exported in the first half of the Iranian calendar year reported Press TV. That figure shows a 30% growth compared to the corresponding figure of the previous year," said Mohammad Mehdi Nahavandi, the managing director of the Commercial Development Office for Trade Promotion Organization of Iran on Saturday. Despite numerous sanctions and the Treasury Department devoting a resource whose sole purpose is to impede Iran's economic growth through country hopping and threatening international banks that they would lose their American connections, Iran has found ways of circumventing those efforts and even growing its customer base for its products. 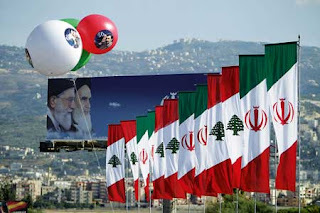 To date the US has tied Iran's largest shipping firm, the complete insurance industry, all Iranian banks including the Central Bank, the gasoline, oil and petrochemical industry, and lately Iranian carpets, saffron and pistachio to the nuclear file. It will be interesting to see what new industry from Iran will be sanctioned because it is supporting the nuclear industry. Keeping in mind that the decision makers in Washington will be looking for industries that have direct involvement to the nuclear industry and avoid impacting the general Iranian population and only the Iranian government. The Iranian government’s Center for Statistics today confirmed its earlier report that the country’s unemployment rate had hit 15 percent in Spring 2010, as compared to 11 percent a year ago [Donya-e Eqtesad, 23 October]. EU foreign policy chief Catherine Ashton today urged Iran to accept her proposal for the resumption of negotiations between Iran and P5+1. Last week, Ashton and her office had proposed the dates of 15-17 November for three days of talks to be held in Vienna over Iran’s nuclear program. Last Friday, Iranian Foreign Minister Manuchehr Mottaki had welcomed Ashton’s invitation, calling it a positive move from his country’s perspective. Iran’s top nuclear negotiator Saeed Jalili had also welcomed the return to negotiations. But Iran never officially accepted the invitation, and in the past few days there have been an official silence in Tehran over the issue. Ashton’s re-invitation came in a form of letter sent to Iran’s ambassador to EU. "The main focus of the meeting would be on the question of the Iranian nuclear program, not excluding any other items pertinent to the discussion," Ashton letter said [AFP, 22 October]. Separately, today Russia also urged Iran to accept Ashton’s offer. Russia’s Deputy Foreign Minister Sergei Ryabkov, who would represent Russia in the negotiations, called on Tehran to agree to negotiations chaired by Ashton [Interfax News Agency, 22 October]. "We urge our Iranian friends and colleagues to officially respond in a positive manner to the invitation," Ryabkov said. Gasoline Prices Remain Unchanged, For Now! Continuing a pattern of conflicting policies announced by Iranian officials concerning the government’s subsidy reforms that are scheduled to go into effect next week, today the official in charge of distribution of subsidized gasoline told reporters that the consumers would still be able to purchase 60 liters (15.8 gallons) of gasoline per month at the current rate of 100 toumans per liter (36 cents per gallon). The announcement came a day after the government started depositing $40 in cash handouts in the bank accounts of more than 80 percent of the citizens to offset the rise in prices of energy-related products, such as gasoline. The government had earlier hinted that the new subsidized gasoline prices would quadruple to 400 toumans a liter ($1.44/gallon). Observers now believe that a simultaneous cash handout, in the tune of $2.4 billion a month, and maintaining subsidized products at current prices would have a disastrous effect on the economy. But at least today this is where the things stand! Iran announced today it has nearly doubled its stockpile of 20 percent enriched uranium within the past four months. The country now has some 30 kilograms, or 66 pounds, of the 20-percent grade enriched uranium, as opposed to only 17 kilograms in June. Iran’s nuclear chief Ali Akbar Salehi made the announcement in Tehran. Iran’s refusal to stop enriching uranium has subjected the country to four sets of UN sanctions, as well additional economic and financial sanctions imposed by the US, the EU and other pro-Western countries. The next step for Iran is converting the 20-percent enriched uranium into fuel rods for use at its research reactor in Tehran. Iran claims it has the technology to produce fuel rods, a capability very few nations possess. The government has said its first fuel rod should be ready within a year. The technologies to produce high-percentage enriched uranium and fuel rods are at the heart of a country’s capability to produce nuclear weapons. But Iran has repeatedly denied it intends to produce the bomb. On the eve of the Iranian government’s planned announcement of the start of its subsidy reforms, the country’s minister of commerce has raised some fundamental objections to the plan, questioning government’s assertions that the reforms have been in planning stages for years and that the details of the plan have all been worked out. Yesterday, the government started distributing cash payouts to 80 percent of Iranian citizens, at a rate of $2.4 billion a month, to offset the expected rise in prices. But the minister of commerce was also issuing warnings that replacing old subsidies with the new ones, and postponing simultaneous reductions in government’s expenditures, would create an “avalanche” that would “destroy” everyone. “On the day the new targeted subsidies starts, we need to start reducing [government’s] expenditures. If we relegate cutting expenditures to a future phase, we would create an avalanche that would destroy us all,” said Minister of Commerce Mehdi Ghaznavi [Mehr News Agency, 19 October]. “The Ministry of Commerce expects that the laws governing targeted subsidies, whose details would apparently be announced by the president next week, should replace subsidy-centered economy with an economy centered on competitiveness,” Ghaznavai added. “My proposals are these: let’s not replace old subsidies with new subsidies. Instead, let’s [eliminate] all subsidies and lets promote competiveness in the economy and replace enterprise managers with those seeking to generate income for their companies. And instead of producing all goods, let’s produce only those goods that have a competitive advantage,” the commerce minister said. Iran Supreme Leader Ayatollah Ali Khamenei arrived today in the holy city of Qom. 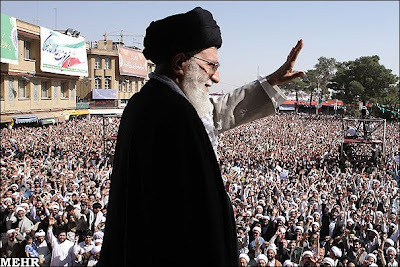 Addressing a public rally in the city, Khamenei said the internal enemies of the Islamic Republic want an Islam without clergymen, and a non-political Islam altogether. He also accused the opposition of sowing “the seed of pessimism” in the Iranian society. Without naming names, Khamenei also accused opposition leaders of “spreading rumors” about the leadership and its achievements. “Such moves are not in line with the interests of the country's future,” he said. On the issue of economic sanctions, Khamenei said the West wanted to exert pressure on the society by these sanction to cause people to lose faith in their leadership. But he declared that the sanctions would have no impact whatsoever on the country. 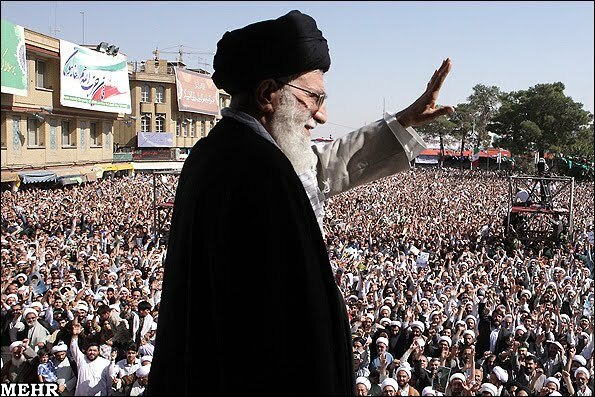 “Today, Iranians are moving towards a bright future with more progress and will thwart enemies' plots," Khamenei added. Source: Mehr and other Iranian news agencies. The Iranian government announced today that 60 million Iranians will start receiving monthly cash payouts of 40,500 toumans, about $40. The payments will start in eastern provinces on Tuesday and within five days would be rolled out in all provinces. The payouts, part of the government’s new “targeted” subsidiary reforms, are to compensate citizens for the rise in inflation rate after the current subsidies in energy sector are ended by next week. The food subsidies will also be phased out in near future. The government has not explained why 14 million Iranians would not receive any cash payouts (Iran has a population of nearly 74 million). The government is apparently classifying these 14 million people as well to do, not in need of cash payout. The monthly cash payout of $2.4 billion in itself is expected to add to the inflation rate. Iraqi Prime Minister Nouri al-Maliki arrived in Tehran today and held meetings with Iran’s Supreme Leader Ayatollah Khamenei and president Mahmoud Ahmadinejad. 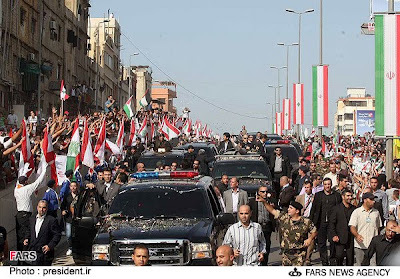 The visit was part of al-Maliki’s attempt to boost his chances for forming the next government of Iraq. 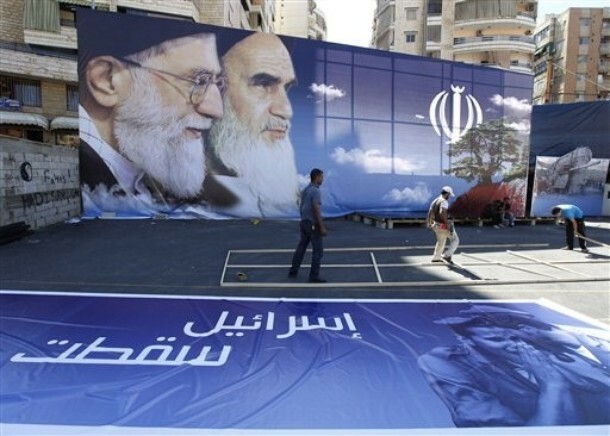 And by hosting al-Maliki at the midst of the struggle among different politicians to be the next premier, Iran is giving its clearest support for his candidacy. Al-Maliki’s rival Ayad Allawi harshly criticized his trip to Tehran, calling it yet another indication that the Iranian government would exert major influence over the al-Maliki government. Observers believe that Allawi not being able to form the government, is leaning towards the premiership of Adel Abdul-Mahdi, currently one of Iraq’s vice presidents. Abdul-Mahdi, a Shite, is a senior member of the Supreme Islamic Iraqi Council (SIIC), founded by Ayatollah Mohammad Baqir hakim, and now led by his grandson, Ammar Hakim. The Kurds are also believed not to have any objection to Abdul-Mahdi premiership. The US government, which was pushing for a government of national unity under al-Maliki with all factions present in the cabinet, is now understood to be leaning toward the Abdul-Mahdi solution. The Iranian government is giving al-Maliki the highest exposure during his visit to Tehran in order to strengthen his position and to prevent the formation of an Abdul-Mahdi government. 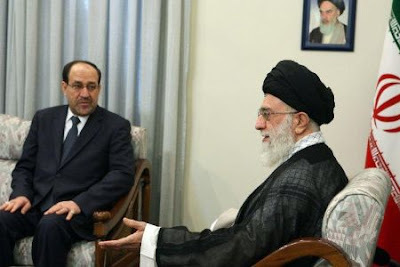 Photo: Iraqi Premier Noui al-Maliki with Iran’s Supreme Leader Ayatollah Ali Khamenei. 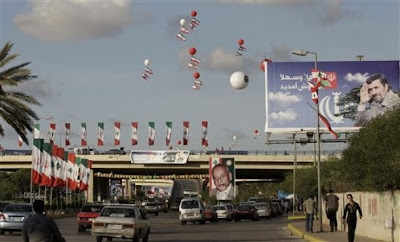 Tehran, 18 October 2010. 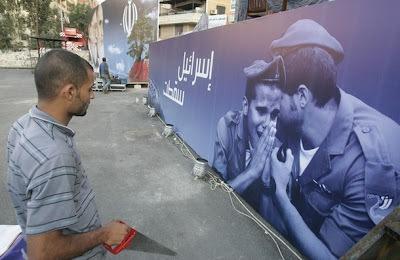 Press TV photo. The chairman of Iran’s semi-official Chamber of Commerce, Mohammad Nahavandian, today criticized the Central Bank of Iran (CBI) for refusing to release its figures on GDP rate of growth for the Iranian fiscal year of 1388 that ended on 20 March 2010. CBI has historically released the annual state of the economy reports, which had included the official growth rate. CBI has offered no explanations for the omission of the growth rate from this year’s report. On another economic news, the CBI has put a stringent limit on the purchase of foreign currency, including US dollars. The Iranians who travel abroad can purchase up to $2,000 at the official rate after providing their airline tickets as proof of their needs for the currencies. The question now remains, what would other people who would need more than $2,000 do? CBI’s silence on the availability of hard currency purchase beyond its new limit has renewed recent speculations that the CBI is contemplating the reintroduction of a two-tier currency exchange rate, an official rate and one based on the free market; and doing it at least in practice without a formal announcement. In the past, the Iranian economy has suffered enormously as the result of irregularities inherent in a two-tire foreign currency exchange system, and its reintroduction would cause same problems. 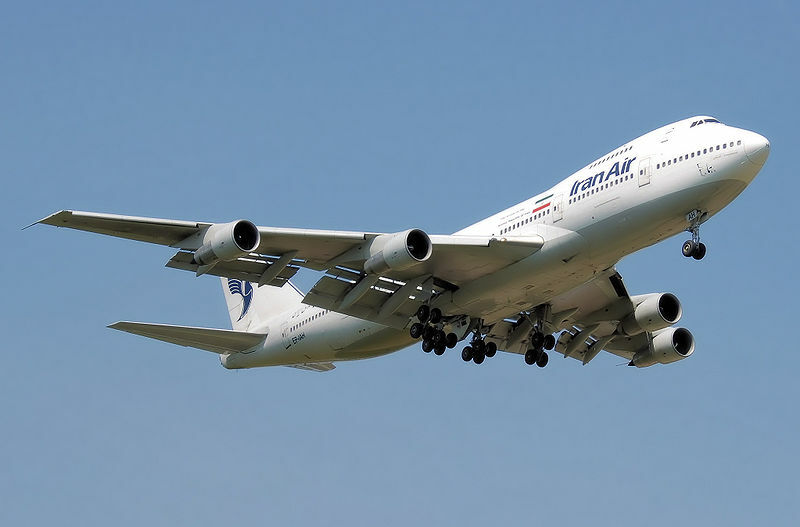 The Washington Post reports today that Iran Air, the national Iranian airlines, has become unable to refuel its planes in most of European airports. Under the new EU sanctions, several major oil companies have cancelled their jet fuel delivery contracts with Iran Air. The list includes BP, Shell and Q8. Vienna and Cologne, Germany, reportedly are the only two airports still providing fuel to the airliner. OMV of Austria has said it would continue refueling Iran Air planes until their current contract ends next month. Total of France, which delivers jet fuel in Cologne, is also not expected to renew its current contract expiring next month. That would leave Iran Air with no airport in Europe to refuel its planes. “We will continue to fly to Europe, if needed with half occupancy to save fuel which we can bring from Tehran,” said Mohammad Jalali, Iran Air District Manager in Amsterdam. “But we are losing time, money and passengers,” he added [Washington Post, 17 October]. Photo: Iran Air Boeing 747-200 (EP-IAH) lands at London Heathrow Airport. June 2008. Photographed by Adrian Pingstone. The momentum for holding three-day talks over Iran’s nuclear program is building up. On Thursday, EU foreign policy chief Catherine Ashton had made the original proposal for the talks to be held in Vienna in mid-November. On Friday, Iran’s Foreign Minister Manuchehr Mottaki welcomed her offer, saying the reestablishment of negotiations between Iran and P5+1 is a positive move from his country’s perspective. Although Iran has not yet officially accepted Ashton's offer, we understand it will do so in the coming days. "The door has been open to Iran for some time, and really - literally, the ball is in Iran's court," Crowley added. "We hope they'll respond to Catherine Ashton and hope we can begin a sustained dialogue with Iran." 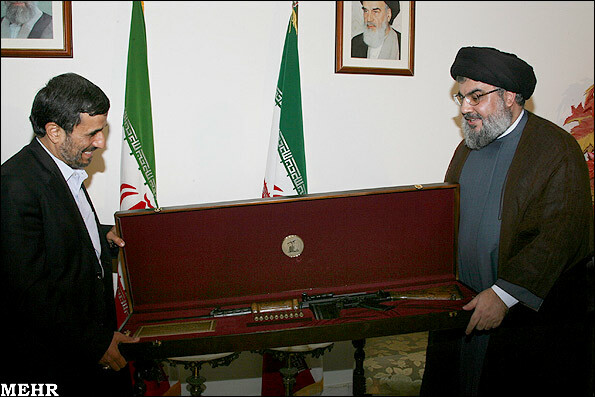 Hezbollah’s Hassan Nasrallah presenting an Israeli rifle to Ahmadinejad. The rifle was reportedly captured during the fighting with Israel in 2006. 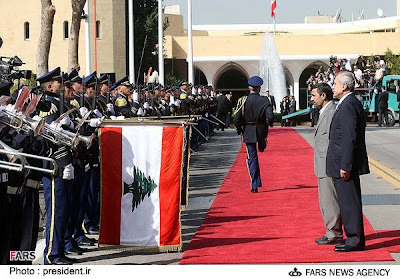 The provocative ceremony took place at the Iranian Embassy in Beirut. 14 October 2010. 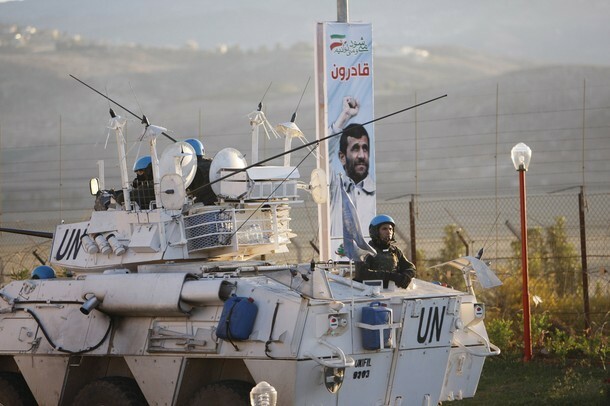 Ahmadinejad also visited Qana, where 106 Lebanese civilians were killed in 1996 when Israeli aircraft struck a base run by UN peacekeepers in which villagers had sought shelter. 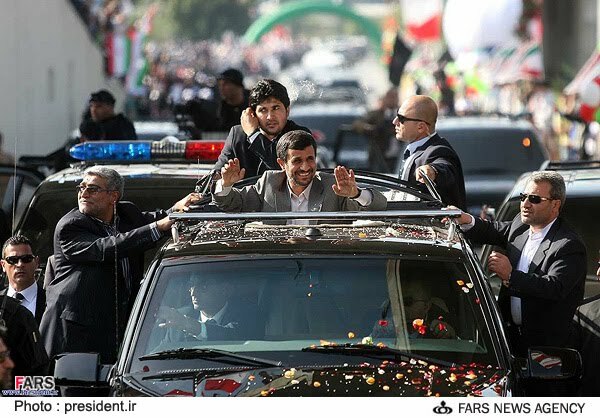 "You are victorious and your enemies are defeated," Ahmadinejad said in Qana. "You will stay and your enemies, who are the enemies of humanity, are on their way to demise and annihilation. 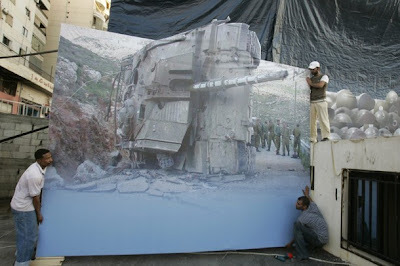 You are honored and your Zionist enemies are humiliated and weak," he added. In Bint Jbeil, Ahmainejad had said Israelis had no option but "surrender” and go back to “their first homes." 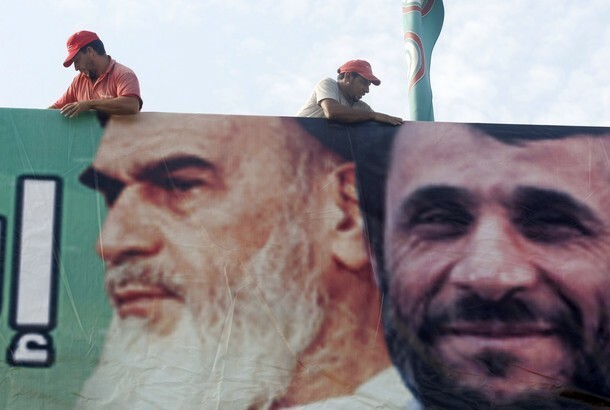 Back in Beirut, Ahmadinejad met Hezbollah leader Sayyed Hassan Nasrallah in the Iranian Embassy. Nasrallah was seen in Al Manar TV footage giving Ahmainejad an Israeli rifle as a gift, which Hezbollah said had been captured during the 2006 war. Israeli Prime Minister Benjamin Netanyahu responded to Ahmadinejad from a hall in Tel Aviv where Israel’s first premier, David Ben-Gurion, declared the creation of Israel in 1948. "We heard today the cursing and the language of contempt from the Lebanon border," Netanyahu said. "We will continue to build our country and we will know very well how to defend it," he added. Iranian Oil Minister Masoud Mirkazemi has been unanimously elected the next president of the Organization of the Petroleum Exporting Countries (OPEC). His term starts in 2011. This is the first time in 36 years that Iran would assume the rotating presidency of OPEC. The organization comprises of Algeria, Angola, Iran, Iraq, Kuwait, Libya, Nigeria, Qatar, Saudi Arabia, UAE, and Venezuela. 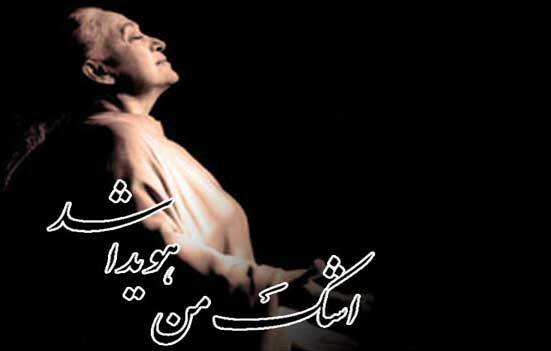 Marzieh, one of the most popular singers in Iranian history, dies today at 85, loosing her battle against cancer. Paris, 13 October 2010. Lebanese tumultuous welcome of President Ahmadinejad upon his arrival in Beirut. The bottom photo shows Ahmadinajad arriving at the Presidential Palace, being greeted by Lebanese President Michel Suleiman (right). Beirut. 13 October 2010. 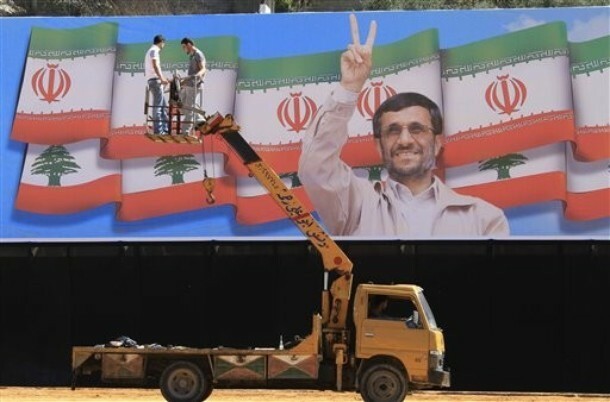 Iranian President Mahmoud Ahmadinejad arrived in Beirut today. 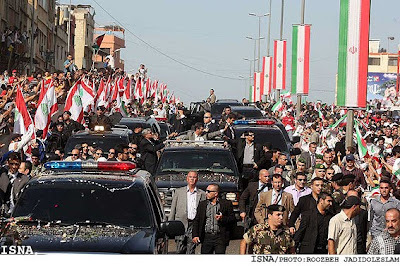 Thousands of Lebanese gave Ahmadinejad a tumultuous welcome upon his arrival at the Lebanese capital. Poster bearing the image of an Israeli Magach 7 (modified M60) main battle tank knocked out during the 2006 war. A worker adjusts a billboard showing a weeping Israeli soldier as preparations are made at a stadium in the southern Lebanese town of Bint Jbeil. 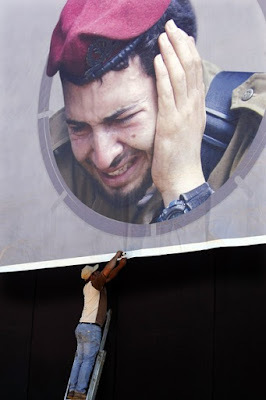 A worker stands in front of a poster of Israeli soldiers reacting; the Arabic words on the poster read: "Israel has fallen." Spanish U.N. peacekeepers serving with the United Nations Interim Force In Lebanon (UNIFIL) patrol on their Pegaso VEC-M1 armored reconnaissance vehicle near a poster of Iran's President Mahmoud Ahmadinejad near the border between Lebanon and Israel, in the village of Kfar Kila. 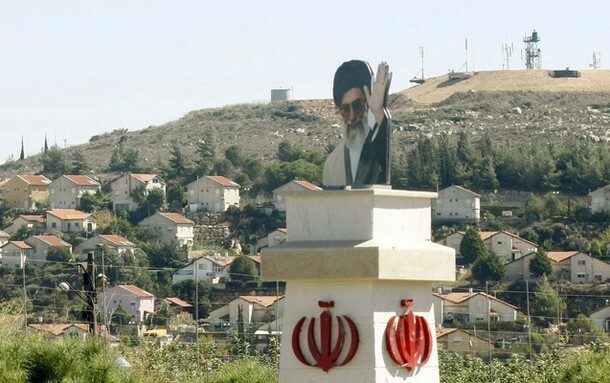 A portrait of Iran's supreme leader Ayatollah Ali Khamenei is fixed on a pillar bearing the crest of the Islamic Republic of Iran in the southern Lebanese village of Kfar Kila on the border with Israel, with the Israeli town of Metulla in the background. Ahmadinejad arrives today in Lebanon to what all can agree has been a polarized debate on a head of State visiting another. He will most likely receive a heroes welcome from the Shiites who have had their cities and homes rebuilt after the 2006 Israeli conflict with funds from Iran. 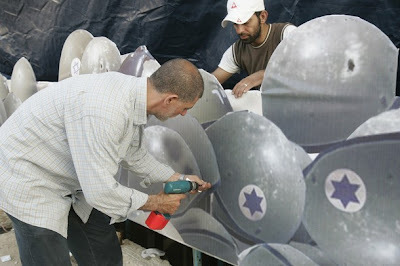 Posters at the time proudly claimed "Israel destroys, and Iran rebuilds". Israel who inflicted the damage in 2006 will be protesting the trip by releasing white and blue balloons near the border. 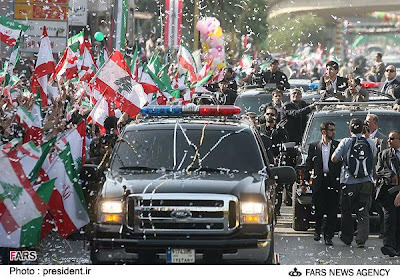 One might think that they are jealous of all the Iranian flags and balloons out to greet Ahmadinejad. Saudi Arabia’s King Abdullah received a telephone call from Iranian President Mahmoud Ahmedinijad today, the state-run Saudi Press Agency (SPA) reported. SPA did not details of the conversation. The highly unusual call must be linked to Ahmadinejad’s visit to Lebanon on Wednesday. 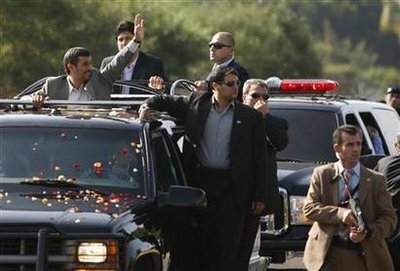 During his two-day stay, Admadinejad is expected to visit the southern regions of the country near the border with Israel. The visit has produced anxieties in some non-Shia quarters in Lebanon. 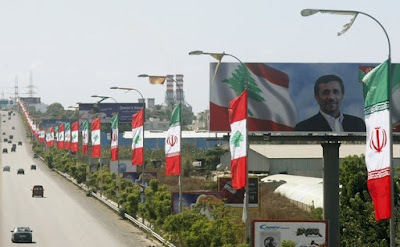 The call to King Abdullah could be an attempt to calm concerns over the visit and an assurance that the Iranian president was not to act in any provocative manner while visiting south Lebanon. The Iranian government’s historic subsidy reforms will go into effect within the next ten days, it was reported today. During its first phase, the amount of subsidies for gasoline, electricity and other energy-related products will be substantially lowered. Reduction in subsidies on other products, like foodstuff, will follow soon. As part of the reforms, the government will deposit monthly cash bonuses in the bank accounts of the heads of all households throughout the country to soften the blow of the expected dramatic rise in prices. The government officials are telling reporters today that the amount of cash bonuses would compensate for the rise in prices, especially for the lower income households (hence the phrase "targeted subsidy" reforms used by the government). Previous governments had in the past two decades also talked about subsidy reforms but did not have the will power to tackle any public outcry resulting from higher prices in goods and services. Iran’s official news agency IRNA reports that an explosion today at the arms depot of the IRGC base in the western city of Khormabad has caused casualties, including a number of deaths. IRNA has not disclosed the exact cause of the incident or the number of dead and injured. UPDATE: 18 IRGC personnel were killed in the blast and many injured. 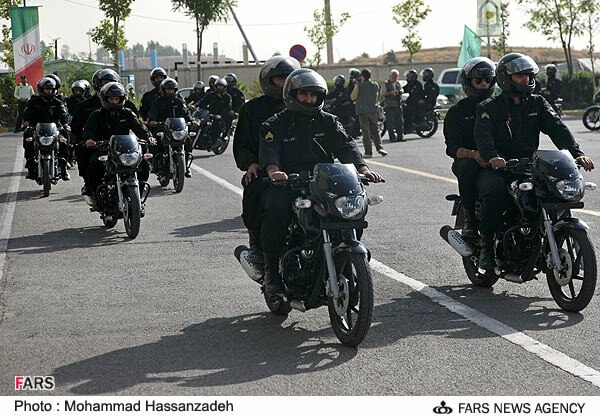 In a major blow to Ayatollah Rafsanjani’s attempt to maintain the status of Iran’s Islamic Free University as an endowed private institution, the country's supreme leader today ruled that the university, the country’s largest, is a public institution and should be managed by government’s Supreme Council for Cultural Revolution [Mashreq Website, 11 October]. Rafsanjani is the founding chairman of the university’s board of trustees and now has to relinquish his authority to President Ahmadinejad who chairs the Supreme Council. 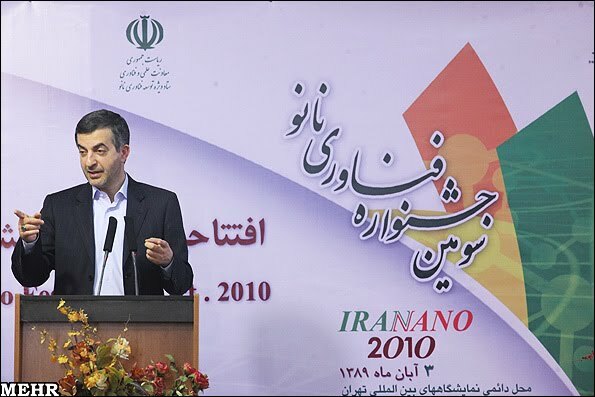 The ruling supported Ahmadinejad’s argument that the Free University should be state-owned and managed like other institutions of higher learning in Iran. But Rafsanjani argued that the university was founded privately in the early years of the Islamic Republic and has been managed by its own board of trustees for nearly three decades, growing into the largest university in Iran and in the region, with campuses across Iran, UAE and Britain. 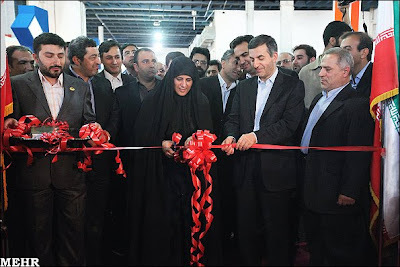 Khamaeni’s ruling against Rafsanjani effectively nationalizes the Free University. The move is also seen as yet another indication of Khamenei’s siding with Ahmadinejad on important issues against his political opponents. UPDATE: Immediately after Khamenei’s ruling on Azad University’s status, Rafsanjani’s website posted a historical note saying Imam Khomeini, the founder of the Islamic Republic, had personally donated 1 million toumans to the university. It also quoted Rafsanjani of reporting to Imam Khomeni that there were forces that wanted to nationalize the university and Khomeini told him not to worry, to continue keeping the university private, and he (Khomeini) would take care of the opponents. Uskowi: This issue has all the markings of a major power struggle centered on the fate of a university. Iran’s Oil Minister Massoud Mirkazemi announced today that the country’s known oil reserves have reached 150 billion barrels [SHANA News Agency, 11 October]. Mirkazemi has also announced the discovery of a new gas field, Sefid (“White”) in southern province of Hormozgan. Sefid reportedly contains 70 billion cubic meters of gas. Rial continued its climb out of its worst showing against dollar, selling at 10,750 rials to dollar on Sunday. Long lines of people trying to purchase dollar in the past few days were also significantly shorter today. 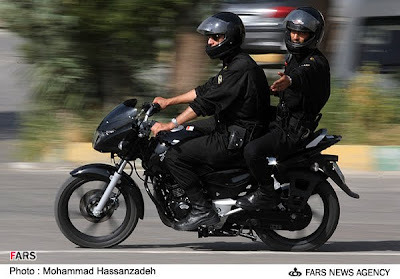 Isfahan judiciary authorities today confirmed the abduction of Amir Hossein Shirani in the city of Isfahan. But the prosecutor general of Isfahan, Qolam Reza Ansari, denied reports that Shirani was an employee of Isfahan Nuclear Conversion Unit. Earlier in the week, the militant Baluchi organization Jundallah had claimed responsibility for the abduction of Shirani, saying he was an employee of the nuclear plant. Jundallah has in the past abducted government employees in Baluchistan, its area of operation bordering Pakistan and Afghanistan. But operating in Isfahan, in the center of the country, would be a new undertaking for the outlawed group. Iran’s First Vice-President Mohammad Reza Rahimi said today in Tehran that the government has successfully brought order to the country’s volatile foreign exchange markets and would never allow the rial lose its value against the US dollar [Mehr News Agency, 9 October]. 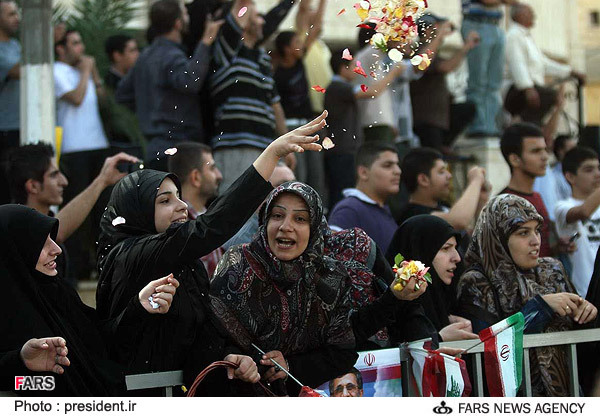 Meanwhile, large crowds reappeared this morning in front of Tehran’s currency exchange shops. People were lining up for 6-7 hours to purchase dollar amid reports that the shops have stopped selling dollar to individuals. Washington expresses disappointment over the resumption of flights between Tehran and Cairo, urging Egypt not to negotiate any deal with the Islamic Republic. Egypt and Iran on Sunday agreed to resume direct flights between their capitals for the first time in three decades. The two countries severed ties in the wake of Iran's 1979 Revolution after Egypt's President Anwar Sadat granted refuge to the deposed Shah of Iran, Mohammad-Reza Pahlavi. "We continue to urge all countries, including Egypt, not to pursue any new business deals until Iran complies with its international obligations," State Department spokesman Mark Toner said on Thursday when asked about the agreement. When asked by reporters if the White House is "going after Iranian civilian airlines," the spokesman said such agreements would have "implications in terms of business" and "economic implications." According to US sanctions put in place in 1995, companies worldwide are banned from selling aircraft or any spare aircraft parts to the Islamic Republic. Russia will reimburse Iran for downpayments on S-300 air defense missile systems, Russian authorities announced today [AFP, 7 October]. Russia cancelled the contract saying the sale of S-300 system to Iran would violate the UN sanctions against the country. Iran has threatened to sue Russia over breach of contract. 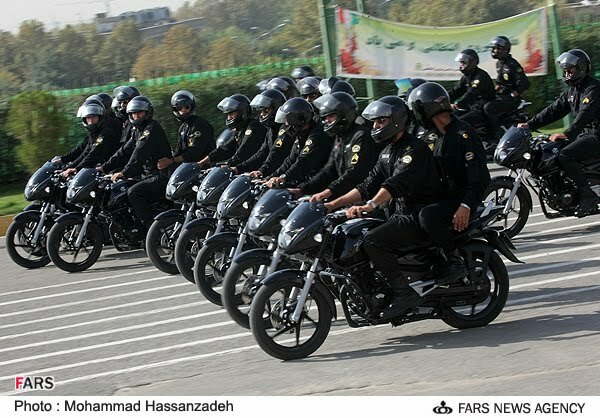 New Police-110 motorcycles appear to be Bajaj 150 cc 4-stroke singles, imported from India. Inadequate safety procedures in effect, such as the non-use of protective hand gloves and instances of flipped open visors without eye protection. 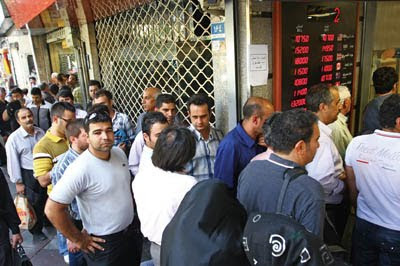 Reports from Tehran’s currency exchange shops that line Ferdowsi Avenue indicate that due to unusually high demands for US dollar, most of the exchange shops had closed their doors, unable to meet the demands at government-imposed exchange rate. Those still opened faced long lines of customers and had to put a purchase limit of $2,000 per customer. They were selling dollar at 10,850 to 11,000 rials. The government has set the official rate at 10,650 rials and has warned the exchanged shops of losing their licenses if they sell at higher prices. The merchants on Ferdowsi Avenue were telling reporters that they had never witnessed such huge crowds lining up to buy US dollar. As part of a gradual end to subsidies, the Iranian government announced today that the prices for airline tickets would be increased by 30% on Wednesday, followed by a 40% increase in railway tickets by the end of October. The government is also expected to announce a 400% increase in the price of subsidized gasoline, from 100 to 400 toumans per liter, or $1.44 per gallon. The maximum allowance of subsidized gasoline per vehicle per month is to be set at 60 liters (15.8 gallons) per month. The consumers could still purchase extra gasoline at a price of 670 toumans per liter, or $2.40 a gallon, a 67% increase over the current price of gasoline without coupons.